Dubai, UAE, May 16, 2018: As the summer temperatures soured in Dubai, Karl Lagerfeld plunged its guests into cooler climes with his Autumn / Winter 2018 Collection. The Fall - Winter 2018 Collection is inspired by one of Karl Lagerfeld's greatest passions, architecture. This inspiration is reflected in the collection in various ways; minimalistic lines, feminine curves, textured fabrics and futuristic finishes. 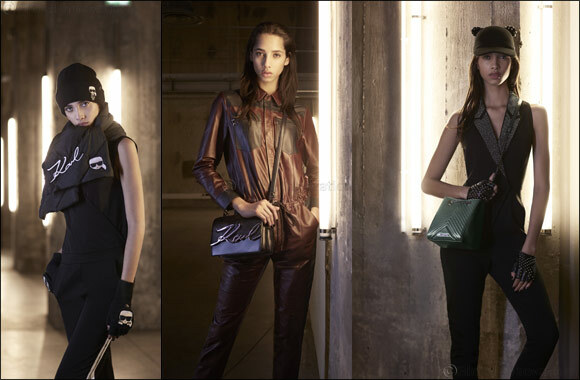 The designs have an athletic-chic feel and are embellished with distinctive KARL Lagerfeld branding. The ready to wear collection is feminine and futuristic, including dresses, skirts and curvy sleeves, to emphasis the feminine shape. Fabrics are cut from futuristic fabric, with reflective trims and strong Karl Lagerfeld branding. A special Karl in Space capsule collection, features graphics of Karl Lagerfeld planet-hoping in a spaceship or dresses as an astronaut. While Karl Ikonik, incudes playful graphics of Karl Lagerfeld and Choupette. Accessories, have been updated to reflect the collection, adding studs, velvet, fringing and Karl Lagerfeld branding. The collection will be available in the Middle East from July 2018.